Welcome to the Forest Park Community Garden! In 2011 we grew from a couple plots in a lot off of Harlem Avenue to a robust, active garden that supplies growing space for the community and fresh produce for the needy. Through our survey we have heard from members on the kind of garden and educational opportunities that are most desired, and we are working on ways to deliver. 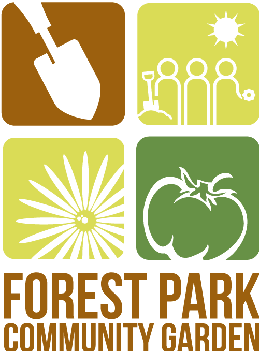 Recently we elected two new board members who will help us coordinate and plan to realize the Forest Park Community Garden's potential. Sign up for news on the garden and programs for 2012 today. Support the community garden with a tax-deductible donation.